Donating to your local area public transit is easy! Through your donations, you are helping provide transportation services to the elderly and those who are less fortunate in Buchanan, Dickenson, Tazewell, and Russell counties. • Greater need and less financial support coming from local and state government. 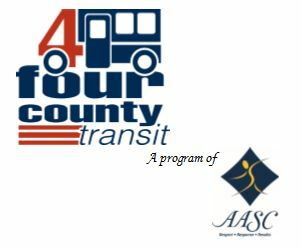 • Four County Transit maximizes donations in order to help the most people. • You can be assured you are making a meaningful difference in YOUR community. All donated money stays within our four-county service area. • Four County Transit workers are passionate about providing care and improving the lives of those in Buchanan, Dickenson, Russell and Tazewell counties. • Four County Transit has a proven track record of successful results. No matter what the reasons for donating are, Four County Transit appreciates your effort in helping provide public area transportation in Buchanan, Dickenson, Russell, and Tazewell counties.